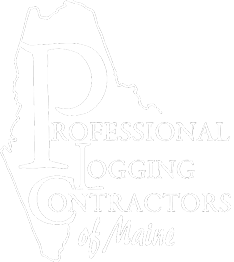 Logging in Maine goes back to the colonial period, when the narrow strip of Eastern North America belonged to England. The British Royal Navy quickly claimed the best stands of light and strong Eastern White Pine for the masts, spars, and planking for their fast and maneuverable ships. England's competitors, the French, the Dutch, and the Spanish, were left to build from the heavier Baltic Fir. As important as the first logging efforts may have been, it was Revolutionary War debt which boosted the first harvests. To raise money, Massachusetts sold land to the District of Maine, and wealthy investors purchased huge tracts of Maine forests. Generating a return on investment may have set the stage, but land settlement pushed logging away from the coast, up the river valleys. Logging filled the growing need for the houses, bridges, fencing, and of course ships for the burgeoning economy of the new United States. As the nation grew, so did the demand for lumber. 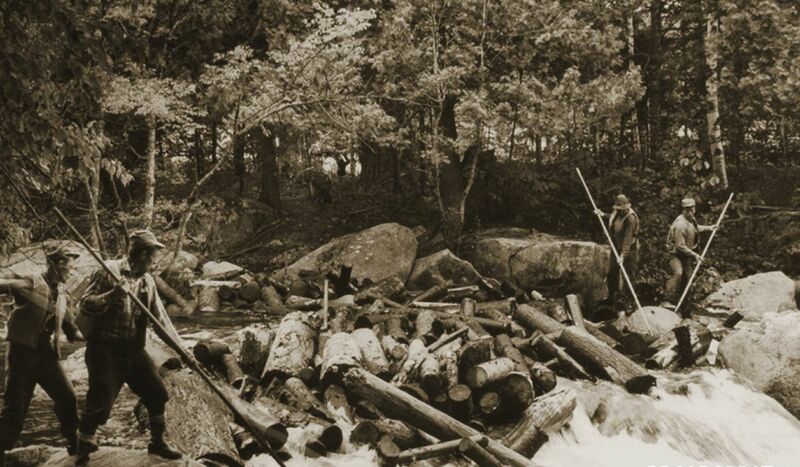 In the north woods of Maine, loggers moved the trees they cut over snow and ice to the banks of rivers. Come spring, and ice-out, they would be driven to cities like Bangor and Machias, Bath and Saco, where they would be sawn and shipped to power a growing construction industry. These early loggers lived in communal camps, built of spruce logs, chinked with moss and mud. A central firepit provided warmth and cooking. Here around the evening fire, was likely born the super-human logger, Paul Bunyan. His epic deeds helped romanticize the hard and dangerous work. After the stories, the crew of 12 to 14 men shared a single bed of balsam fir boughs, knowing that tomorrow would consist of another day in the snow and cold, felling trees with axes and moving the logs to riverbanks. A bit later, axes gave way to crosscut saws, which increased speed and production. Although loggers worked independently until the 1820's, logging cooperatives and boom companies came to manage the harvest process. As the demands for specific species of wood changed, so did the loggers, many of whom worked for large timberland companies like Plum Creek and Great Northern Paper and International Paper. Mechanized harvests fed the growing appetite for newsprint and magazine paper. This picture changed too, along with new production technology, as financial interests outside Maine moved their efforts to other parts of the country and of the world to take advantage of lower-cost, non-unionized labor; and they sold off their timberlands. Today's Maine logger has come full circle. 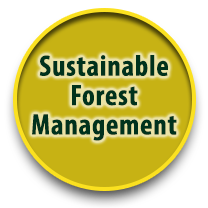 He is likely a self-employed, independent wood harvester or small businessman, who is contracted by landowners, who harvests, and then markets their timber to various buyers. Technology allows the logger to be more productive, in that what once took days may now be accomplished in hours. Generally speaking, today's markets seek wood for paper, bio-mass and specialties. Today not much Eastern White Pine goes into ship masts, but the construction industry still calls. Although new markets and new demands present challenges to Maine's independent logger, people like W.C. Tripp will continue the centuries-old tradition of innovation and hard work in answering them.